IMPERX high performance LED Lighting provides easy-to-use integrated lighting solutions with power and cabling options to handle even your most demanding industrial application requirements. Lighting options include ring light or bar light configurations with choice of LED colors, lens angle, and diffuser. Illumination levels can be set manually via an external rotary switch or controlled remotely via TTL input using pulse width modulation. Flash (strobed) operation is also supported for high speed inspection applications. Each LED Lighting solution can be used stand-alone or seamlessly integrated with IMPERX cameras to reduce system installation and integration time. The LED Power over Ethernet (PoE) Ring Light is the first of the IMPERX high performance LED Lighting solutions. 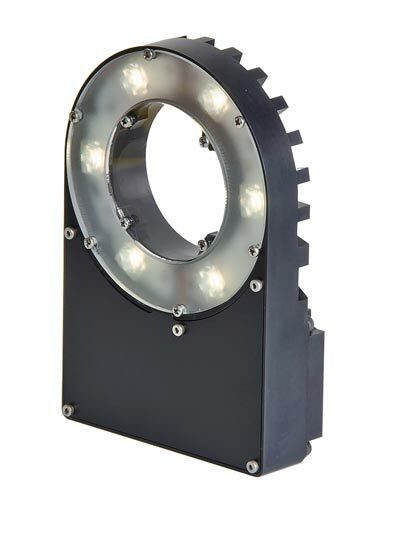 Building on the IMPERX legacy of imaging innovation, the LED PoE Ring Light simplifies cabling and installation by providing LED light power, camera power and camera communication through one PoE cable! With only one cable needed to operate both the light and the camera AND with the flexibility to locate the camera/lighting system up to 100m away from the computer and power source, installation has never been simpler or more reliable. Find the LED Lighting and Camera Solution That is Right For You.